What is Your Theory On Blackhole Radiation? Do Black Holes Destroy Information? Figure 1. The spacetime geometry of the Schwarzschild black hole solution can be depicted in different ways. In this representation, ingoing light rays always travel along ingoing lines heading toward the top and left at 45°; outgoing light rays asymptotically approach 45° lines at large radius r. Massive particles, with their slower speeds, must travel within the light cones (blue) between outgoing and ingoing light rays, as illustrated by the red path. No light ray can escape to infinity from inside the vertical dotted line, the horizon located at the mass-dependent Schwarzschild radius R(M). Instead, any trajectory beginning inside the horizon is pulled to a central point, the singularity at r = 0, where spacetime curvature becomes infinite. The critical radius r 0 where the energy of m changes sign is called the horizon radius. The region inside this critical radius is called a black hole. See: Can we make objects of zero mass? Did Hawking Say “There Are No Black Holes”? 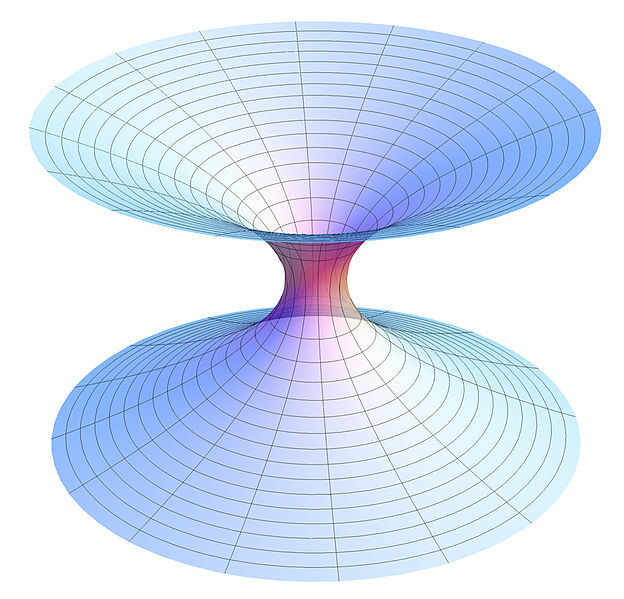 Theorists have forged a connection between wormholes in spacetime (above) and a quantum phenomenon called entanglement. 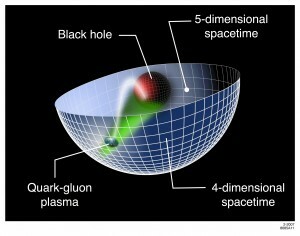 Falling into a Blackhole- On Sept. 25, four theoretical physicists — Raphael Bousso (U.C. Berkeley), Juan Maldacena (Institute for Advanced Study), Joseph Polchinski (U.C. Santa Barbara) and Leonard Susskind (Stanford University) — answered your questions about the latest theories about what happens when matter falls into a black hole and how these ideas are prompting researchers to reconsider our understanding of gravity. Metaphors and analogies: scientists’ friends or foes? General relativity contains solutions in which two distant black holes are connected through the interior via a wormhole, or Einstein-Rosen bridge. These solutions can be interpreted as maximally entangled states of two black holes that form a complex EPR pair. We suggest that similar bridges might be present for more general entangled states. This lecture presents some particular thoughts that rang a bell for me in terms of what reporting was done here earlier on the thought experiments by Susskind on how one may interpret information gained by the process of entanglement to an observer outside the black hole. See:The elephant and the event horizon 26 October 2006 by Amanda Gefter at New Scientist. The Reference Frame: Are black holes surrounded by firewalls? The Black Hole of What? In networking, black holes refer to places in the network where incoming traffic is silently discarded (or "dropped"), without informing the source that the data did not reach its intended recipient. When examining the topology of the network, the black holes themselves are invisible, and can only be detected by monitoring the lost traffic; hence the name. The most common form of black hole is simply an IP address that specifies a host machine that is not running or an address to which no host has been assigned. Even though TCP/IP provides means of communicating the delivery failure back to the sender via ICMP, traffic destined for such addresses is often just dropped. Note that a dead address will be undetectable only to protocols that are both connectionless and unreliable (e.g., UDP). Connection-oriented or reliable protocols (TCP, RUDP) will either fail to connect to a dead address or will fail to receive expected acknowledgements. 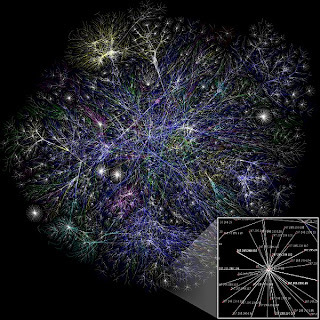 Most firewalls can be configured to silently discard packets addressed to forbidden hosts or ports, resulting in small or large "black holes" in the network. Black hole filtering refers specifically to dropping packets at the routing level, usually using a routing protocol to implement the filtering on several routers at once, often dynamically to respond quickly to distributed denial-of-service attacks. Some firewalls incorrectly discard all ICMP packets, including the ones needed for Path MTU discovery to work correctly. This causes TCP connections from/to/through hosts with a lower MTU to hang. A black hole e-mail address is an e-mail address which is valid (messages sent to it will not generate errors), but to which all messages sent are automatically deleted, and never stored or seen by humans. These addresses are often used as return addresses for automated e-mails. A Conformal Field Theory Approach? A conformal field theory is a quantum field theory (or statistical mechanics model at the critical point) that is invariant under the conformal group. Conformal field theory is most often studied in two dimensions where there is a large group of local conformal transformations coming from holomorphic functions. 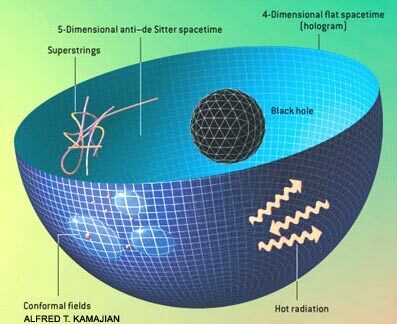 If your not sure what I mean, have a look at what is happening on the surface of the sphere, as a means from which a 2D description, is describing the black hole in a 5d space. Have you seen this image before? Recreating the conditions present just after the Big Bang has given experimentalists a glimpse into how the universe formed. Now, scientists have begun to see striking similarities between the properties of the early universe and a theory that aims to unite gravity with quantum mechanics, a long-standing goal for physicists. “Combining calculations from experiments and theories could help us capture some universal characteristic of nature,” said MIT theoretical physicist Krishna Rajagopal, who discussed these possibilities at the recent Quark Matter conference in Annecy, France. Consider any physical system, made of anything at all- let us call it, The Thing. We require only that The Thing can be enclosed within a finite boundary, which we shall call the Screen(Figure39). We would like to know as much as possible about The Thing. But we cannot touch it directly-we are restrictied to making measurements of it on The Screen. 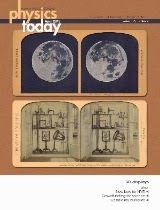 We may send any kind of radiation we like through The Screen, and record what ever changes result The Screen. 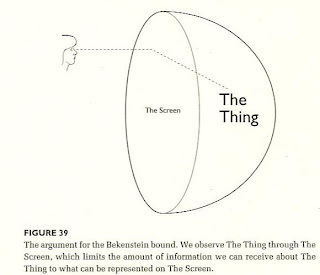 The Bekenstein bound says that there is a general limit to how many yes/no questions we can answer about The Thing by making observations through The Screen that surrounds it. The number must be less then one quarter the area of The Screen, in Planck units. What if we ask more questions? The principle tells us that either of two things must happen. Either the area of the screen will increase, as a result of doing an experiment that ask questions beyond the limit; or the experiments we do that go beyond the limit will erase or invalidate, the answers to some of the previous questions. At no time can we know more about The thing than the limit, imposed by the area of the Screen. The strings move in a five-dimensional curved space-time with a boundary. The boundary corresponds to the usual four dimensions, and the fifth dimension describes the motion away from this boundary into the interior of the curved space-time. In this five-dimensional space-time, there is a strong gravitational field pulling objects away from the boundary, and as a result time flows more slowly far away from the boundary than close to it. This also implies that an object that has a fixed proper size in the interior can appear to have a different size when viewed from the boundary (Fig. 1). Strings existing in the five-dimensional space-time can even look point-like when they are close to the boundary. Polchinski and Strassler1 show that when an energetic four-dimensional particle (such as an electron) is scattered from these strings (describing protons), the main contribution comes from a string that is close to the boundary and it is therefore seen as a point-like object. So a string-like interpretation of a proton is not at odds with the observation that there are point-like objects inside it. Holography encodes the information in a region of space onto a surface one dimension lower. It sees to be the property of gravity, as is shown by the fact that the area of th event horizon measures the number of internal states of a blackhole, holography would be a one-to-one correspondance between states in our four dimensional world and states in higher dimensions. From a positivist viewpoint, one cannot distinquish which discription is more fundamental.